President Ashraf Ghani will visit China from October 28 – 31 on his first formal trip abroad. China’s Foreign Ministry announced today that newly inaugurated Afghan President Ashraf Ghani will pay a state visit to China next week. It will be Ghani’s first trip abroad since assuming office on September 29. Ghani will be in China October 28 to 31, according to the Chinese Foreign Ministry. Ghani’s visit will coincide with this year’s ministerial meeting of the Istanbul Process, to be held on October 31. 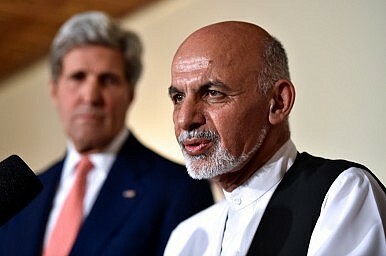 Ghani, as Afghanistan’s president during and after the withdrawal of most U.S. and NATO troops, will play a major role in the success (or failure) of Afghanistan’s system of governance. As such, China lost no time inviting Ghani for a visit to lend its support to his administration. Beijing’s hosting of this year’s Istanbul Process will also showcase China’s leadership in multilateral efforts to protect Afghan stability. The Istanbul Process meeting was originally scheduled to take place in August; it may have been pushed back to account for an unexpected delay in resolving the results from Afghanistan’s presidential election. Had the meeting taken place as originally scheduled, it would have had to involve Afghanistan’s previous presidential administration. For China, there are a number of reasons to help support Ghani’s government as much as possible. In a worst-case scenario, regime collapse or near collapse (such as the current situation in Iraq) would be a disaster for China’s security interests. A failed state, likely hosting a number of terrorist and militant groups, would destabilize China’s western regions, particularly the already-restive Xinjiang Uyghur Autonomous Region. Beijing is already greatly concerned about the movement of foreign militants into Xinjiang; regime collapse in Afghanistan would greatly exacerbate this issue. In remarks to the press, Chinese Foreign Ministry spokesperson Hua Chunying said that Ghani’s visit is designed to “deepen pragmatic cooperation between the two countries in various fields, showcase the Chinese government’s support for Afghanistan’s smooth transition and peaceful reconstruction and promote further development of bilateral strategic cooperative partnership.” She added, “China will as always do what we can to help with the peaceful reconstruction of Afghanistan.” Afghanistan and China are expected to sign a number of cooperation agreements during Ghani’s visit to help jumpstart bilateral cooperation under the new Afghan government. Ghani’s choice of China as his first destination abroad is symbolic as well. It shows that Ghani will seek a closer partnership with his country’s largest neighbor as Afghanistan moves into a new, post-NATO era. When it comes to China, the Afghan government hopes to find political support, but perhaps more importantly, economic assistance. A statement from Afghanistan’s Office of the President said that Ghani will “speak to a gathering of Afghan and Chinese investors and businessmen, and will pay a visit to large installations and structures” during his visit to China. Afghanistan could potentially receive a number of infrastructure and other economic investments from China as Beijing pushes ahead with its “Silk Road Economic Belt,” connecting western China with Central Asia and beyond. The Silk Road Economic Belt could help revitalize Afghanistan’s economy, which in turn could help deter the rise of militants – but by the same token, security concerns could also prevent or slow down economic cooperation between these two neighbors. Afghanistan’s southern neighbor faces a similar issue with the development of a China-Pakistan Economic Corridor. Ghani’s choice to visit China so soon after taking office continues a broader trend, begun under former president Hamid Karzai, of diversifying Afghanistan’s regional connections. Afghanistan increasingly seeks to partner with China rather than remaining reliant on the U.S. for aid and political support.